We hope you and your loved ones are staying strong in these very challenging and hate filled times In which our collective response and resistance needs to be more muscular. 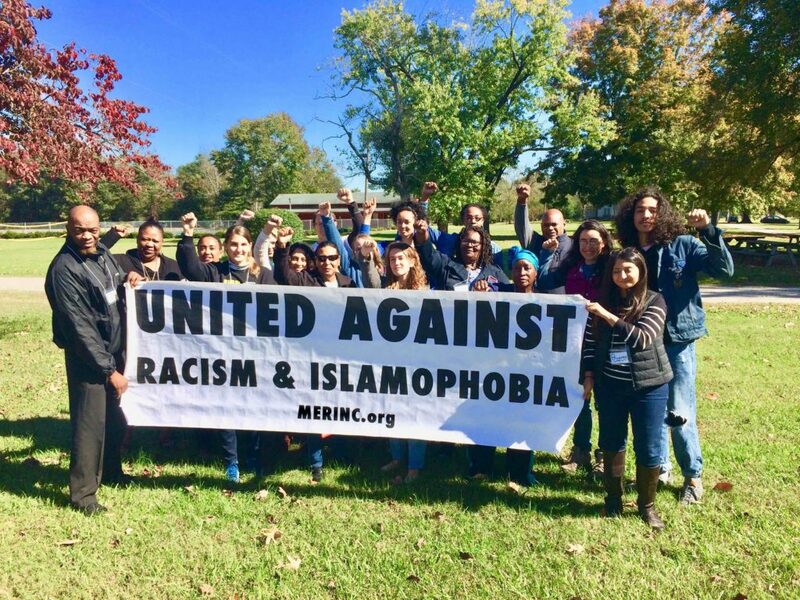 MERI is leading the work to build an intersectional movement against racism and Islamophobia in North Carolina. This work is even more critical today with rising attacks on immigrants, refugees, Muslims, African Americans, and other community members. We are writing to ask you to support MERI’s work in North Carolina. We are currently witnessing wide-ranging attacks on marginalized communities, including Supreme Court’s decision to uphold Muslim Ban and targeting of Black/Brown/Muslim immigrants and refugees. We are also witnessing ongoing institutional racism attacks ranging from voter suppression, police brutality, gentrification, school-to-prison pipeline, and other forms of anti-Black racism. 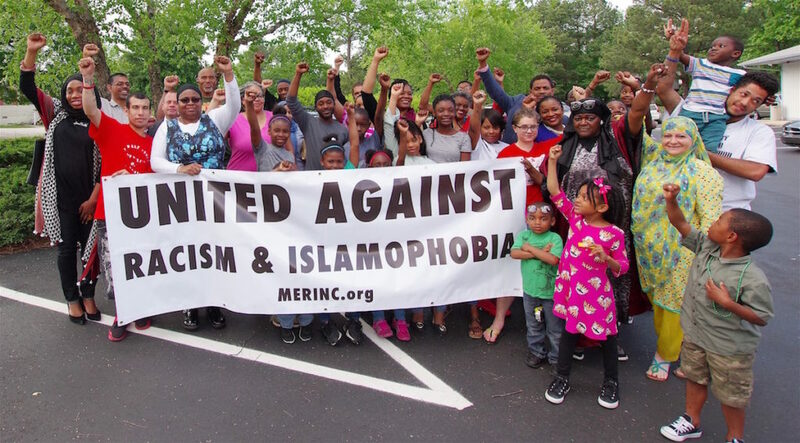 MERI has strengthened our relationship with frontline Black/Brown/Muslim organizations that are fighting against anti-Muslim bigotry, racism, sexism, and other oppressions. We are supporting recruitment of volunteers to support rapid response work by Muslims for Social Justice. We are engaging our network in response to anti-Muslim policies. Please see a brief report from 2018 below. MERI Media Team organized workshops to write letters-to-editor and social media campaigns to fight racism and Islamophobia. MERI Media workshop hosted by Muslim Women For and the Light House on April 24, 2018. 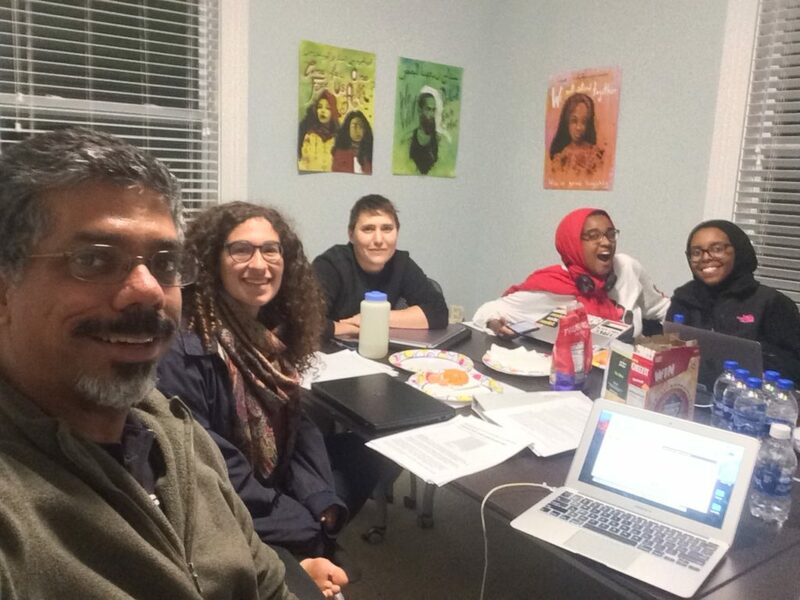 MERI organized anti-racism/anti-Islamophobia workshops at local churches, synagogue, and refugee resettlement agency. 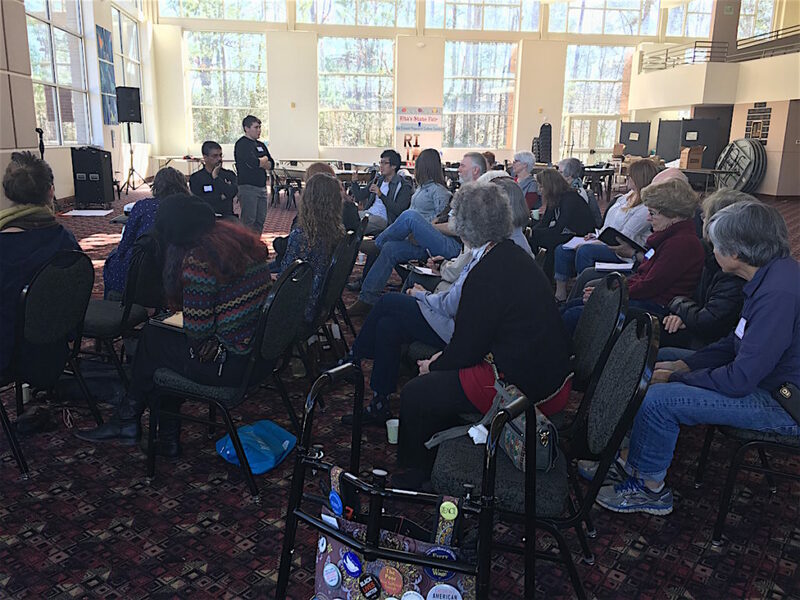 MERI organized a workshop titled “Challenging Racism and Islamophobia” at Judea Reform Congregation on March 4, 2018. MERI organized our network to protest Supreme Court’s ruling to uphold Muslim Ban. 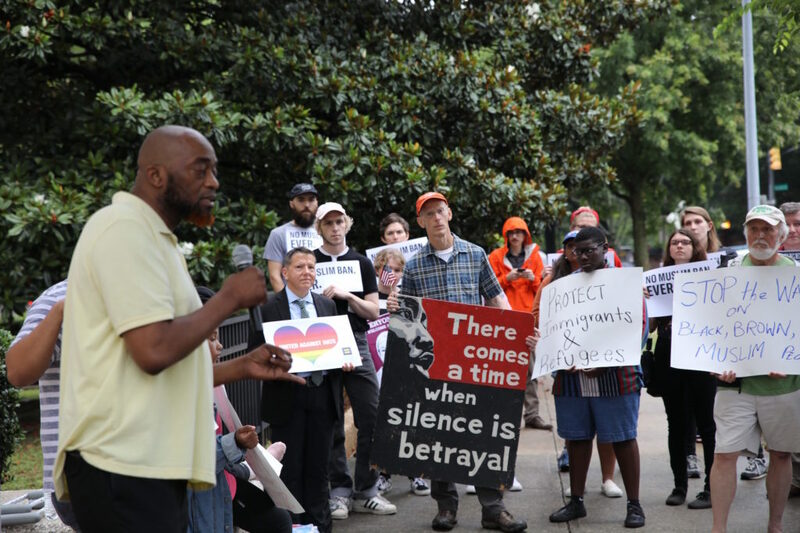 Members of MERI and partner organizations gathered outside Terry Sanford Federal Building in Raleigh to protest Supreme Court’s decision on Muslim Ban on 6/26/18. 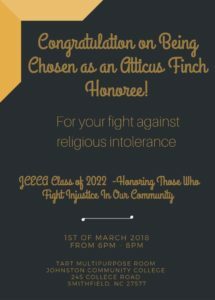 MERI was the recipient of the Atticus Finch Award Against Racism by Johnston Community College Class of 2022. Please see a list of our activities in 2018 and earlier on our website. MERI is excited to expand our team by adding Lela Ali (Muslims Women For) as our Steering Committee Member and establishing a partnership with the Light House Project. Our goal is to raise at least $10k and sign up 30 new monthly sustainers in during our fundraiser that end on August 1, 2018. 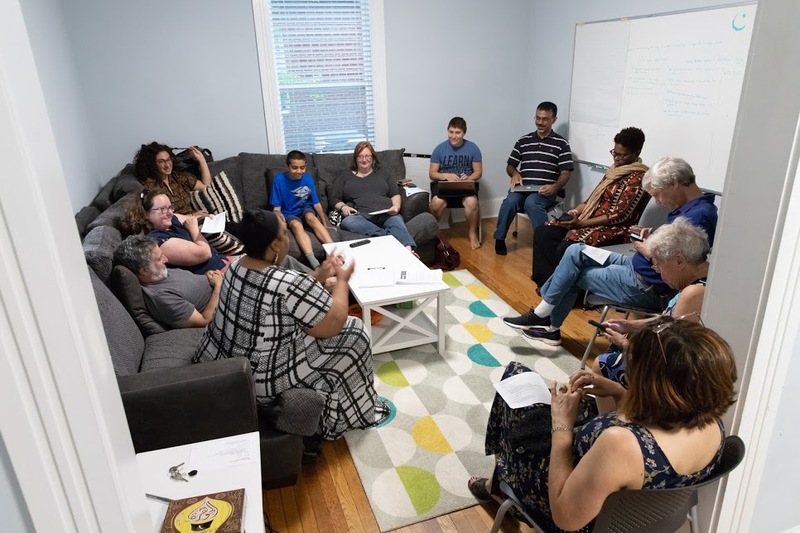 These funds will support two co-coordinators, fund projects by frontline Black, Brown, Muslim organizations, provide stipends for workshops, and other projects. MERI is a member-supported organization, and we need your support to accomplish our goals. Your tax-deductible donations will help us continue challenging Islamophobia, racism, and all forms of oppression in 2018. We hope you will contribute using the link below. Can you pledge to become a MERI monthly sustainer? Recurring monthly donations ensure our important work can continue in the coming year. One-time contributions in any amount are also crucial support. Please contact us at info@merinc.org. We know we can count on your social justice partnership, your continued financial support, and your participation in MERI events.